'Be a Charts Champion' is a series where we will discuss better ways to present charts and graphs. In the first post of this series, I would like to share with you an interesting link which a reader Rishi Behal shared with me a day back. 2. Once you decide on a chart type Juice Analytics provides you a ready made excel sheet. You can download the excel sheet which lets you feed in your data and generate the chart automatically. This feature is especially helpful when you don't want to waste time creating a chart. Or you don't know how to create one. Eg. You might want to use a waterfall chart but you don't know how to create one. 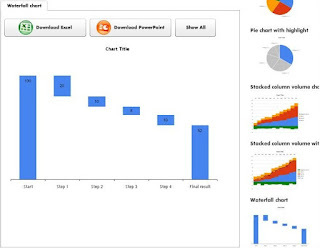 With Juice Analytics, you can simply download the excel, feed in your data and copy the graph to your PowerPoint. In total there are 17 chart types available. Try it out the next time you want to save time creating a chart. In case you know of more such links do share them with me.